Your "labor of love" might be a long and expensive and frustrating process. If you continue with that, do the mechanical work first. That is, don't wasting your time painting and polishing until you are sure it will run. and THEN make the decision about a second bike while you finish the project. If it fires right up and seems to be in good condition, you might not need another bike, at least not right away. In my (not so humble) opinion, the sweet spot for motorcycle engines is 900-1200 CCs regardless of bike style. Above that the extra displacement is usually wasted. As far as the engine it runs when i got it home i changed plugs, fresh gas. sitting still idling and revving it sounds good. found out it needed a gas tank due to rust holes in the bottom. when i found that i started looking for a tank or parts bike. i found and bought one. i not really going to paint anything like you said till i know the mechanical side is good. i have done some work on the bike already. i have done some work on the bike already. So.....you have what appears to be a used bike in reasonable condition that runs. I suggest a short test ride or two to be sure it runs good........and then forge ahead. Unless maybe there is something about that model that you don't like. My 2 cents, if its not what you really want in a motorcycle I would just sell it and use the money towards what you really want. 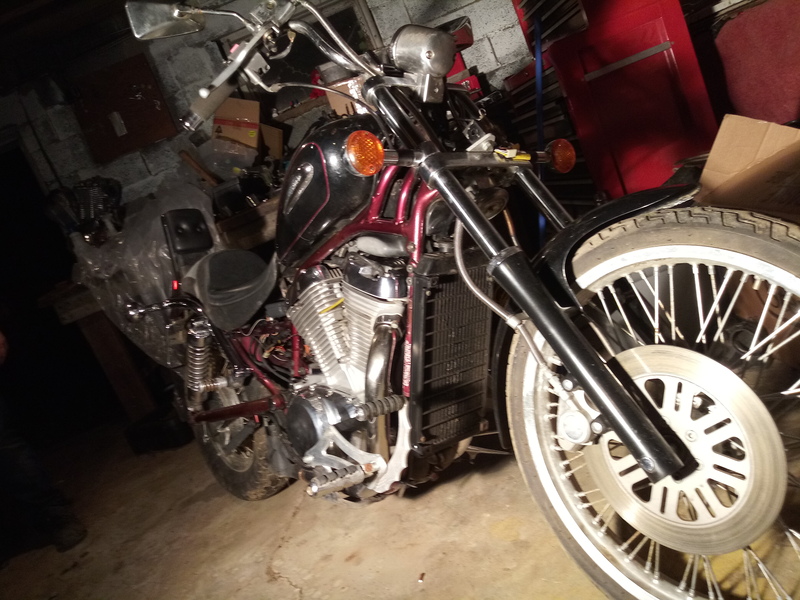 If, on the other hand, you think you'd love riding this bike for years to come then there is a certain satisfaction to saying "I fixed this up and it runs and looks great". You most likely won't get a good return on your labor fixing it up and selling it. Sorry I can't fill out the survey because I'm not you! Good luck. even if i don't like it i will keep it. my family would be upset if i got rid of it. i am used to the old 750 Honda 4 cylinder bikes. my only complaint with the Suzuki when i sat on it for the first time is where the foot controls were(factory location). a parts bike i found had the forward controls on it already so i switched them over. i am enjoying working on the bike. i have plans from painting it back the factory color to doing a different paint job on it. not really worried about the paint on it right now.